In the tech space, time moves quickly. 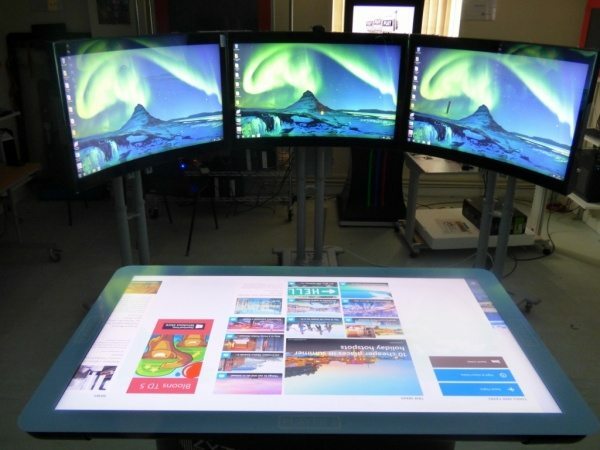 Whilst the movie industry is coping up with the trend, bit by bit, a projected capacitive touchscreen technology (PCAP touchscreen) is influencing the industry as well. Touchscreens and multi-touch interfaces are now part of the fundamental language of human-computer interaction. Whether you are a Sci-fi buff or just a fan of the latest 007 blockbuster movie, it is very difficult to miss the increasing presence of touchscreen technology. Well, needless to say, the technology has the most profitable industry on Earth. From handheld Personal Access Display Devices (PADDs) of Star Trek to Marvel Avengers’ fleet carrier, touchscreen technology is featured in these movies. Have you watched George Lucas Star Wars original film? We can actually say that the link between touch technology and science fiction is present. In fact, the near future has already existed even before through the movies. The influence of these technological ideas is so profound. Every generation of film-makers re-imagines something what we want to do and what we can’t do in the future. So, they write about it to inspire kids and young at hearts to fulfil such dream. Thus, science fiction and technology is all about timing. Isn’t it great if you have created an awesome touchscreen display and you have seen it in movies afterwards? It works for most renowned filmmakers. Should it also work for you? Unfortunately, it will not. It is unfair, right? Even if you are a science fiction person, nothing is more frustrating than seeing something remarkable in theatres. It is designed to blow people away with breakthrough technology. Although touchscreen technology is not cheap, it is created to deliver new gestures and prolonged life for multiple user software. Thus, it does not cost you much when it comes to upgrades or replacements. It is a blatant ploy to be trendy and sophisticated. In any industry, it is always our attitude to impress or to make humans say “Wow!” This interface does not require a lot of data entry and face display tilting for a better experience. So, touchscreens are obviously ergonomic. It is a sneak peak of the future. Taking a step back, surely, the future of touchscreen technology is revealed at the movies. Touch technology on the big screen plays a part in creating demand for our interactive solutions. This is something we can all be excited about. The development of technology and engineering toolset has levelled up. Every business, every industry must adopt the change as well as its trend. In the world of film-making, this might be surreal. But, the real deal here is that digital era is already here. To be more competitive and profitable, investing a projected capacitive touchscreen technology in movies is a must. For those who are au fait in the movie realm, it is no surprise why touch technology is utilised. Do you want to experience such advantage? Look for a PCAP touchscreen manufacturer to assist you on your needs.